Kathy is Of Counsel with Calcagni & Kanefsky. As the Director of Operations and Marketing, she partners with the Firm’s leadership to define and execute key initiatives, including professional development, legal ethics, talent development, and brand management. Prior to joining Calcagni & Kanefsky, Kathy consulted with a variety of companies, offering marketing, editing, research, SEO monitoring, and professional writing services. Kathy is a former Staff Attorney and Director of Externships at a non-profit environmental law firm, where she also maintained an Adjunct Professorship at Rutgers School of Law in Newark. 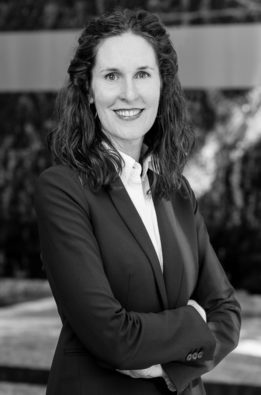 In this role, Kathy served as lead attorney for environmental litigation, conducting advocacy and coalition-building for non-profit environmental groups. She also supervised law students and taught classes as part of the Rutgers Environmental Law Clinic. Kathy began her career as a trial associate at international law firms in Philadelphia and Chicago, where she focused her practice on white collar criminal and regulatory defense. Kathy is a team leader for Cycle for Survival, a movement to beat rare cancers. Kathy is responsible for helping organize various campaigns via the Cycle for Survival Team Pedaling Sunshine, a national fundraising vehicle for rare cancer research at Memorial Sloan Kettering. Kathy has served as a keynote speaker for various American Cancer Society Relay for Life events. She served as an AmeriCorps VISTA Volunteer with University Settlement in New York, NY, where she led an after-school employment and community-organizing group, bolstered corporate sponsorship of a community job network, and created an adult mentorship program.